A First for me: one of my recipes posted on another blog! “Go ahead now, go ahead, get down!” in the words of Kanye West, I believe. That’s what I feel like singin, cause I had “a first”: one of my recipes was posted on another blog! Woot! Now, if you read my blog, you know I don’t actually create many recipes myself. I usually find one that another blogger created and give you guys the link! (why re-create the wheel??!!) But for my Chia Seed Dressing recipe, I actually created it all by my self from scratch, without any help from a “real” recipe creator, or my mama! Sometimes I amaze myself, it’s true. And all this on the one year anniversary of the Organic Eater blog, hurray! Happy 1st Birthday, bloggy! More on that later. And so, this recipe was reposted in a B-utiful post at Rate Your Burn, which has 14 gorgeous chia seed recipes in the post. It’s really weird to see your own photograph on somene else’s blog. It looks sooo much prettier there. wow. Check it out! RateYourBurn | 14 Creative, Delicious, Protein-Packed Chia Seed Recipes. Somebody asked me for a homemade Ranch Dressing, and I needed one myself, so here we go! And I LOVE the way this one lets you mix the spices before hand, and add them to the dairy base when you’re ready for it! Easy! Enjoy the link. Lisa’s blog is fantastic, and she is a fellow Charlotte blogger! 80k like her facebook page. Wow, that has some great potential for impacting the ‘Real-Food World’ for good! Recipe: Ranch Flavored Dip « 100 Days of Real Food. 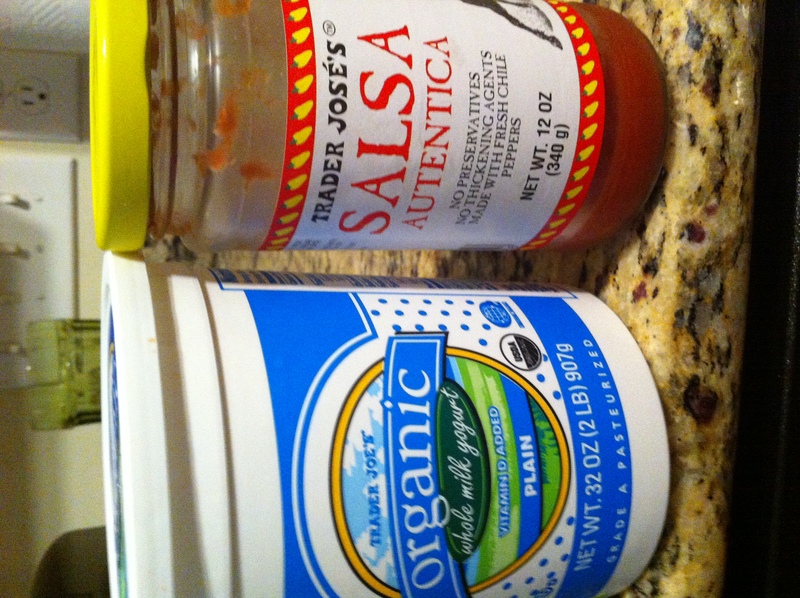 PS: use organic or grass-fed, or hormone free sour cream (it will be labeled “hormone free” on the container if it is). I am going to try it with organic plain whole fat yogurt (Greek if I can find it), since we use plain yogurt in place of sour cream most of the time. Once you put the food under it, it tastes almost exactly the same anyway, so why not get the probiotics by using yogurt?! Let me know if you like this, and I’ll do the same! I have a recipe for you that uses Chia seeds. Yes, the same seeds that many of us grew up hearing about on that awesome commercial “Ch-ch-ch Chia!” Now you can be like me, and every time you hear about Chia Seeds you can have that li’l diddy in your head! Please watch it on YouTube if you have no idea what I’m talking about. And drumroll please: I created this myself, no link to another blog. I didn’t even Google a recipe for inspiration, I just started creating! You may be impressed now. Go ahead. Of course, you can add chia seeds to almost anything: salads, smoothies, homemade breads and snack bars. Even adding them to a glass of water is great (but gets slimey fast). 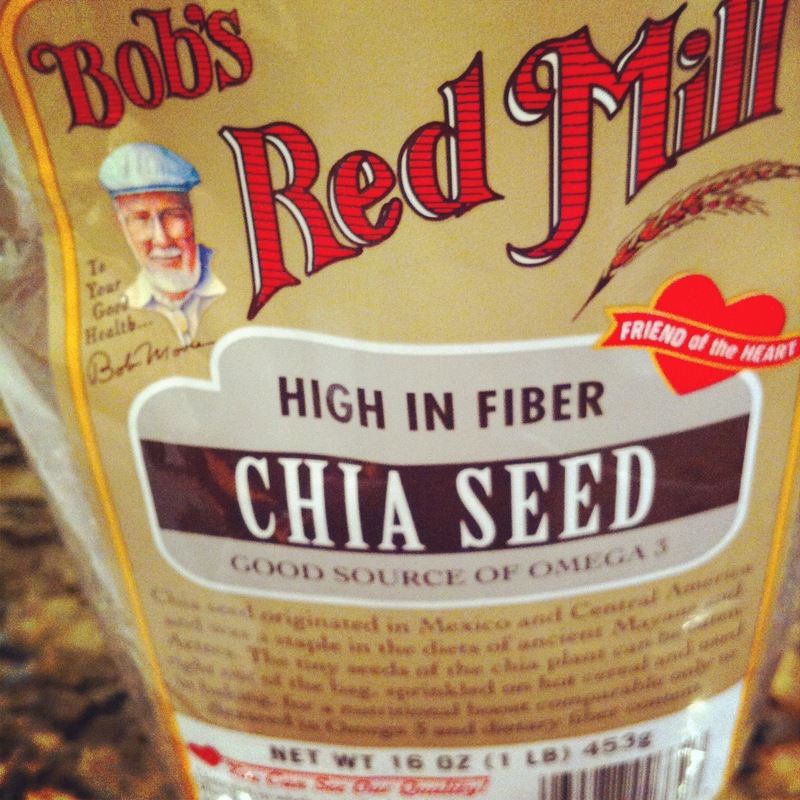 Just about er’body needs a lil more chia in their life (for their Omega 3s! ), and we’re all eating lots more fresh local green salads now that greens are coming in, right??!! So, here’s a sweet Chia Seed Dressing that is like any poppyseed dressing you’ve had before, except this one is home made, so you know what’s in it, and that’s always good to know what you’re eating. Add about equal parts oil and vinegar, add a dash of coconut milk (to make it white), a sweetener (start small and keep adding), and some chia seeds. That’s it. I’m not even giving measurements, because it depends on how much you want to make, and some prefer it more vinegary, while others like it more oily. Other milks would probably work too, that’s just what I had on hand. I used grapeseed oil because it has a light flavor. Almond oil may be another good one. Olive oil would need to be mild in flavor, in my opinion, to work well. I used raw local honey to sweeten it, but I may try stevia or coconut sugar next time. I added too much to my batch, so start with a small amount and add more if needed. 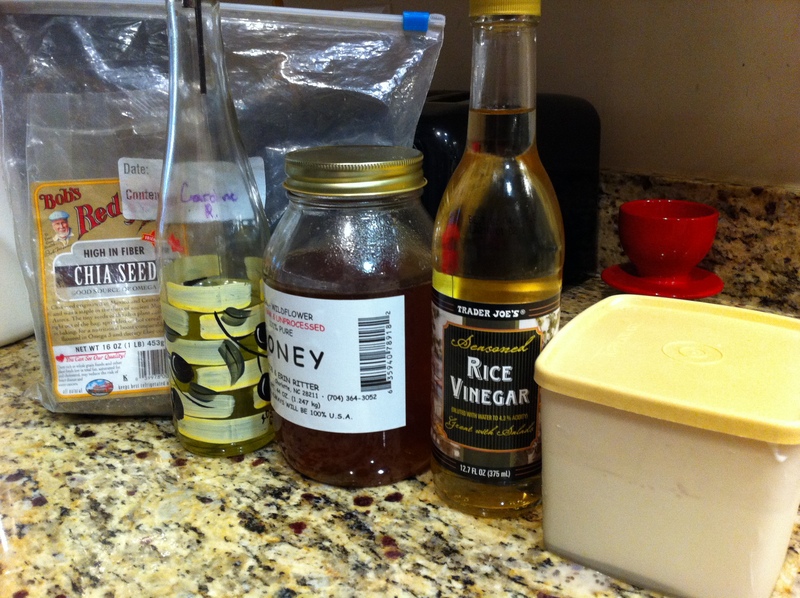 I used rice vinegar, but apple cider vinegar may work too. Experiment and let me know your results! 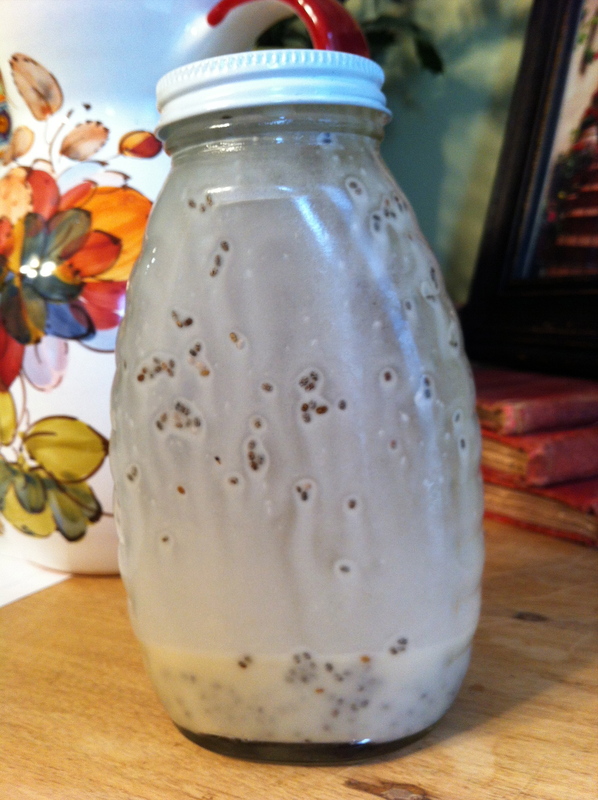 If you have made a poppyseed or chia seed dressing like this before, leave a link below in the comments. I’d love to read another recipe. Isn’t she lovely? 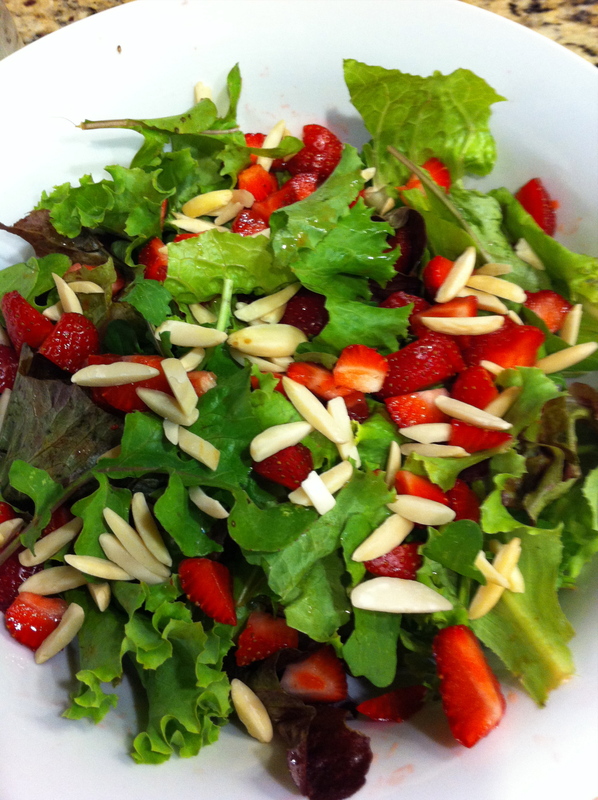 Mixed organic local greens, raw almonds, organic local strawberries, goat cheese, and my Chia Seed Dressing. It was delightful. The kind of salad that makes you wish you had girlfriends over, who could enjoy it with you, because the hubs just doesn’t appreciate a good strawberry salad the way girlfriends would! Oh, he ate it, but without the same elation that I had. So, now for more info on the amazing Chia Seed. The Crunchy Betty blog had a terrific post on the benefits of chia seeds this week, and she included some recipes and a face wash with chia seeds. If you’re hungry for more, click on her link below for more ch-ch-ch-chia Chia Lookin’ Swell, Baby | Crunchy Betty. UPDATE 12/1/12: because I like to educate myself and my readers on ALL sides of the nutritional story, I am including this link to why Butter Believer isn’t crazy about overloading on chia seeds (and flax too). The main problem being, there are better sources for the health benefits of chia seeds, and our bodies have trouble converting the chia seed’s ALA Omega 3s into EPA and DHA (usable form). So, study and decide for yourself. It’s good to be back. I have so much in this ol brain, but not enough hours in the day to blog! If you want to keep up with me daily, I’m usually hanging out on Instagram most days. Maybe I’ll see ya there.